The incredible edible powdered egg. Despite the at-times negative media attention (we all know how reliable the main-stream media is nowadays) eggs are a very nutritious source of food that is one of the cornerstones in baking. With it’s low-cost but high-quality source of protein, if it weren’t for its short shelf life and fragility, it would be a great addition to your survival store if only you could store it. Well, unbeknownst to many people, eggs can in fact be stored (up to 10 years if stored correctly) in the form of dehydrated egg powder — perfect for bug-out bags, camping trips and long-term food storage. They can be used in baked goods just like normal eggs or reconstituted and made into fluffy scrambled eggs. Step 1: Whip up a half-dozen eggs using a blender (for a more complete mixture). And then then in a non-stick frying pan, cook the egg solution like you would when making scrambled eggs. 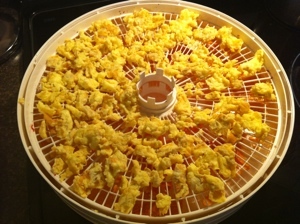 Step 2: Place cooked eggs onto a drying rack in your dehydrator and set the temperature to about 145 degrees Fahrenheit. Step 3: Let dry for around 4 hours until completely brittle throughout. Step 4: Chop dried chunks in a blender or food processor (or coffee grinder) until it has a fine powdery constancy. Bag it and store it away. 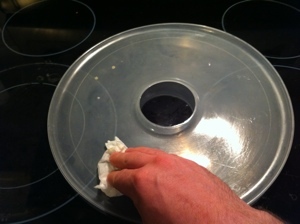 Step 1: Lightly grease a fruit roll sheet (it comes with the dehydrator) with a paper towel. 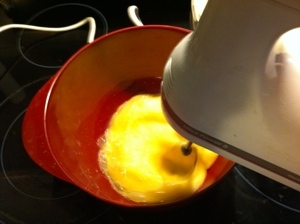 Step 2: Whip up a half-dozen eggs using a blender (not necessary but it does make for a a more uniform mixture). Pour the egg slurry into the fruit-roll sheet and set the temperature to about 145 degrees Fahrenheit. 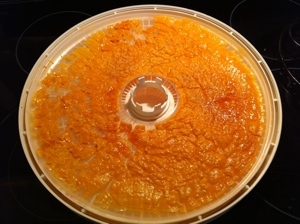 Step 3: Let dry for around 16 hours until completely brittle throughout. 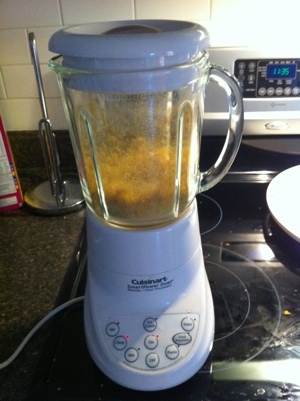 Step 4: Place dried chunks in a blender or food processor (or coffee grinder) until it has a fine powdery constancy. Bag it and store it away. When comparing the two methods there is most definitely a clear winner — the wet dry method. This is surprising since most of the information found online and in books explains that you should use the cook-dry method. Their main reasoning is that by cooking them it will kill any potential salmonella bacteria. I find this point irrelevant since after reconstituting them you will be cooking with them anyways (as you would with the original eggs) which will kill the salmonella. The only advantage I found with the cook-dry method is the quickness of the drying time (four hours compared to 16 with the wet-dry method). Beyond that, when reconstituting the cook-dried eggs and cooking them like scrambled eggs, they have a grainy texture, and they taste dry and stale. They also do not fluff up like normal eggs when cooked in a pan. I assume this lack of “rising” would not work to well in baked goods that require this “leavening” property. The wet-dry method produces a much better product. 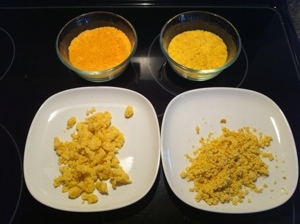 Although the powder turns initially orange, when reconstituted and cooked like scrambled eggs, the orange turns to yellow and they taste, look, and feel just like non-dehydrated egss. They also maintain the “leavening” property and fluff up which is important for baking. 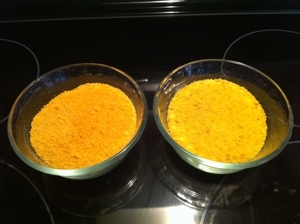 Powdered eggs can be used in the same exact manner as regular eggs. The only thing you’ll not be able to do is create things like poached eggs, or sunny-side-up eggs etc. But for all other needs like baking, french toast, scrambled eggs and so on, you’ll have the same results — but in a much more compact and storage-friendly form. 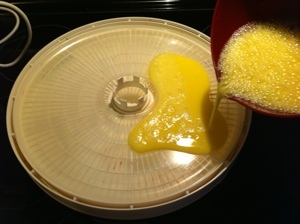 Reconstituting powdered eggs is a simple process. To make the equivalent of one average sized egg mix 1 heaping tablespoon of egg powder together with 2 tablespoons of water. Stir it up, let it sit for 5 min and use as you would normal eggs. 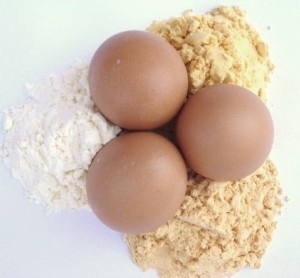 After trying out this process, I’m not sure if it’s entirely worth it to spend 16 hours to make a dozen powdered eggs. 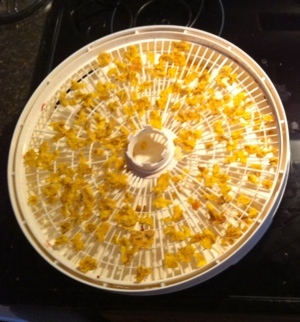 I assume if I had a better dehydrator with more than two fruit-roll sheets it would be an easier process, but given what I got it would take 120 hours to fill a #10 can (it fits about 7 1/2 dozen eggs) if I used the wet-dry method (the cooked dry egg taste so bad I wouldn’t even consider it). Also, since you can purchase really cheap powdered eggs online, equivalent to what you would pay for fresh eggs in the store, makes it even less appealing. 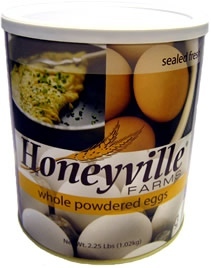 For example, from HoneyVilleGrain.com (where I get my powdered eggs from) you can purchase a six-pack case of #10 cans of powdered eggs for $89.99. This is equivalent to 45 dozen eggs (each can fits about 7.5 dozen eggs) – enough for a year’s supply for a small family. At $89.99 that’s around $2 a dozen. Not too bad. Where this whole process would definitely be worth it is if you had chickens that produced more eggs than you typically consume. This would help to store up a good amount of eggs when the chickens go through their down phase. I got the chickens and therefore the eggs. I am so tired of eating eggs, I have been feeding them to the dogs. This 'recipe' will help immensely. Thanks loads. This is just what I was looking for! Time to get the dehydrator out and get busy. I have chickens and I am getting covered up in eggs. Now I can save them for later and also for long term storage. Thank you!